Fudge lovers: Try The Chocolatiers' own signature product. We use only the best ingredients for a smooth and creamy fudge. Try ours and you'll be hooked! Available in several flavors: Chocolate, Vanilla, Chocolate Walnut, or Assorted. We package it in a beautiful box wrapped to maintain freshness. 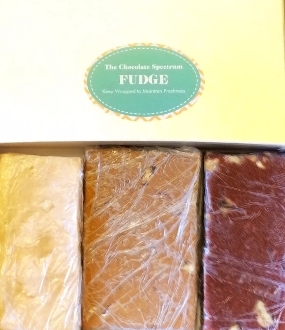 It makes a really beautiful gift for the fudge-lover in your life!